Isolated in the Pelican Bay SHU from 1990 to 2014, Yogi supported his SHU comrades’ campaign to end solitary confinement. He participated in the hunger strikes and applauded the Agreement to End Hostilities, authored by 16 of his comrades, Black, Brown and White, and dated Aug. 12, 2012, three years to the day before he was killed. It has nearly erased racial violence from California prisons. The comrades who conceived and wrote the agreement were following Yogi’s lead. 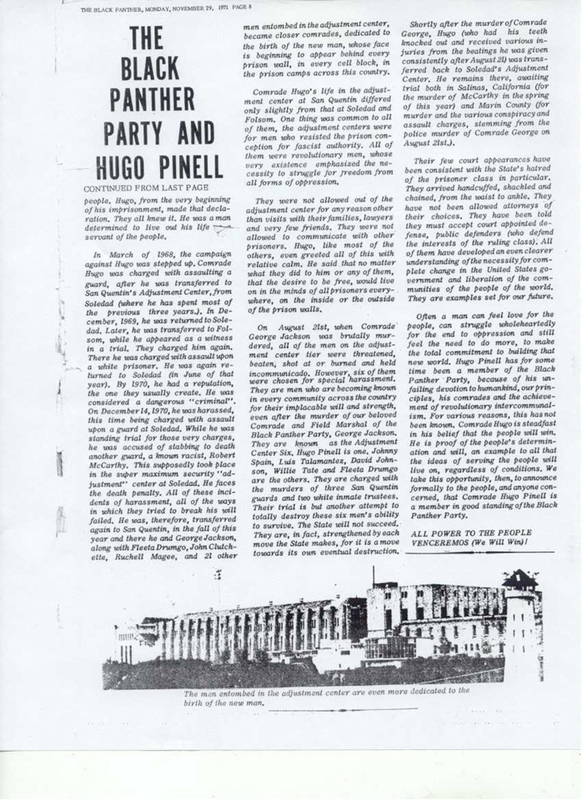 “There was a time in the prison sys­tems throughout the United States,” according to a story headlined “The Black Panther Party and Hugo Pinell” in The Black Panther newspaper of Nov. 29, 1971, “when the prisoners themselves were divided, not only white against Black, but Latinos against Blacks. This – the result of racism in every area of U.S. society – was particularly apparent in Cali­fornia prisons. “Blacks and Latinos fought, stabbed and killed each other in the yards, cell blocks and dining halls of every prison camp from Tehachapi to Tracy. This is always the case when the racist white prison guard, under administration orders, pits one man struggling to survive against another. 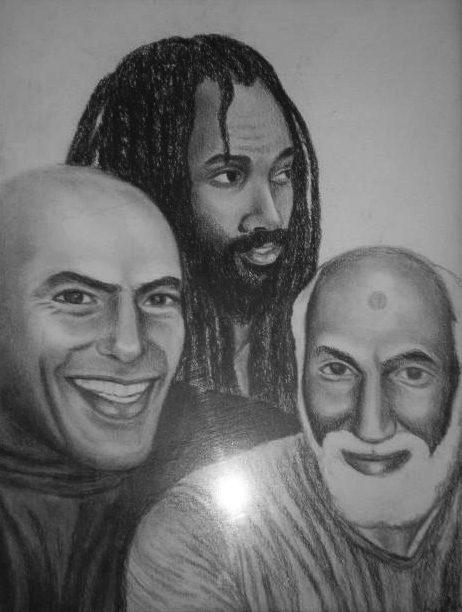 “(B)rothers and sisters across the country inside the maximum prisons began to awaken to the fact of their oppression. They began to realize, as Comrade George Jackson would say, that they were all a part of the prisoner class. “They be­gan to realize that there was no way to survive that special brand of fas­cism particular to California prison camps except by beginning to work and struggle together. … The prisoner class, especially in California, began to understand the age-old fascist principle: If you can divide, you can conquer. 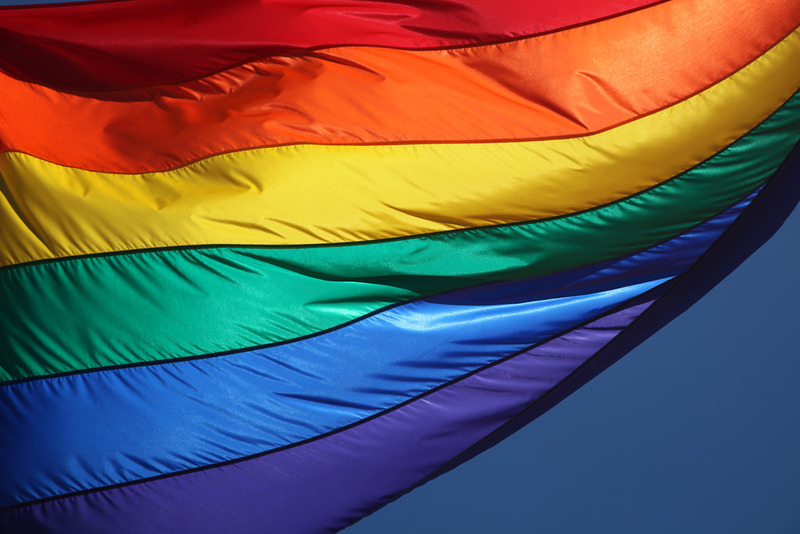 “There are two men who were chiefly responsible for bringing this idea to the forefront. They helped other com­rade inmates to transform the ideas of self-hatred and division into unity and love common to all people fighting to survive and retain dignity. These two brothers not only set this example in words, but in practice. “Comrade George Jackson and Comrade Hugo Pinell, one Black and one Latino, were the living examples of the unity that can and must exist among the prisoner class. 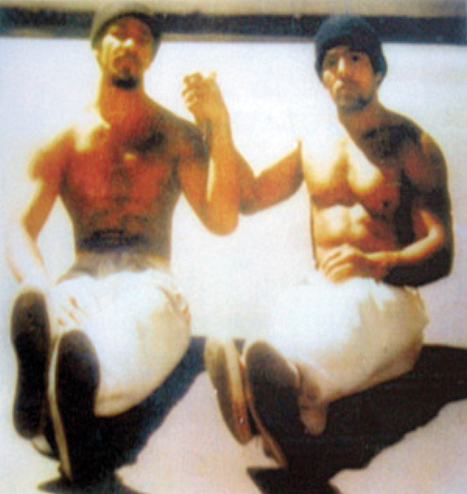 These two men were well known to other inmates as strong de­fenders of their people. “Everyone knew of their love for the people, a love that astounded especially the prison officials of the state. It astounded them so thoroughly that these pigs had to try and portray them as animals, perverts, madmen and criminals in order to justify their plans to eventually get rid of such men. “For when Com­rades George and Hugo walked and talked together, the prisoners began to get the message too well. What happened on New Folsom Prison’s B yard on Aug. 12, 2015? California, the prisons are abundantly funded, but the billions of taxpayer dollars are spent in secret, as the media are prohibited from covering prisons. So the stories coming from the mainstream media about Yogi so far are based on press releases from CDCr, the Corrections Department, not from reporters who go inside to hear from prisoners. Highly paid prison guards and their CCPOA (California Correctional Peace Officers Association) are called the most powerful lobby in the state. Guards at New Folsom, located in a suburb of Sacramento, the state capital, likely exert much of that influence. Is that why Yogi was sent there after more than 23 years at Pelican Bay? Yogi’s enemies were not his comrades in the prisoner class – though he reportedly died at the hand of one or two prisoners, said to be white, though their race is unconfirmed. He was no threat to other prisoners. It was the guards who loathed him and loath the Agreement to End Hostilities, which he exemplified and set in motion over 40 years ago. Did they have him killed to demolish the agreement, to rekindle all-out race riots? Riots are job insurance for guards. Does this sound like a place where Hugo Pinell, the legend, the giant amongst conscious guerrilla revolutionaries, would not be protected? Did the other prisoners even know that Yogi would be joining them on the yard on Aug. 12? What else are the guards afraid of? Black Guerrilla Family – According to family members of prisoners who have been negotiating the hunger strikers’ demands with CDCr administrators since the hunger strikes began in 2011, CDCr has decided to remove the Black Guerrilla Family from the list of eight prison gangs because it’s a political not a criminal organization, but reportedly the guards and their CCPOA are furiously opposed. If BGF is not a prison gang, then all the Black prisoners “validated” as BGF “gangsters” would have to be released from SHU. George Jackson University – Abdul Olugbala Shakur (s/n James Harvey) recently settled a suit to legitimize George Jackson University, which 25,000 prisoners signed up for when he and other prisoners and outside supporters founded it years ago. Guards are adamantly opposed to the distribution and study of books that prisoners might find mentally and spiritually liberating and have prevented the prisoner-led institution from taking root. Though the settlement terms have not yet been revealed, guards are undoubtedly fearful. Class action lawsuit to end solitary confinement in California – Currently in settlement talks with CDCr are the attorneys for the plaintiff class of prisoners who have been held in the Pelican Bay SHU for 10 years or more. The attorneys are led by Jules Lobel, president of the very prestigious New York based Center for Constitutional Rights, the public interest law firm that also represents many of the hunger-striking prisoners at Guantanamo Bay. The New York Times is giving the case multi-media coverage, including a recent video showing some of the plaintiffs describing how they survive the torture of long term solitary confinement. If the case doesn’t settle, trial is set for December. These initiatives, bolstered by the awakening in the court of public opinion to the evils of mass incarceration and solitary confinement, are driving efforts by California prison guards and their “union,” CCPOA, to demolish the carefully constructed Agreement to End Hostilities and revert to racial warfare that divides and conquers prisoners of all colors so that the guards can rule over them as cruelly as they want without getting their hands dirty. The Bay View, joining a consensus of prisoner family members and advocates, calls for investigations into Yogi’s death at both the state and federal level. We challenge California Attorney General Kamala Harris, now a candidate for U.S. Senate, and U.S. Attorney General Loretta Lynch to demonstrate they believe this Black life – the life of Hugo Pinell – matters. Harris, whose office acts as the attorney representing CDCr, needs to counsel her client to reign in the guards, especially the gang investigators. We also call for the full and fair investigation of all deaths in jails and prisons, where incarcerated people are routinely abused and tortured and even killed. 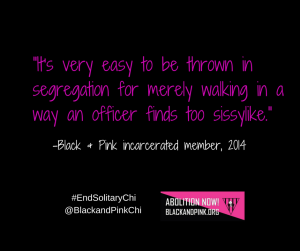 Begin with Sandra Bland and Hugo Pinell. Yogi’s attorney, Keith Wattley, says his family is planning a wrongful death lawsuit. To anyone tempted to avenge Yogi’s death against another race, remember the wisdom of the Panthers: “If you can divide, you can conquer.” Ever wonder why the Bay View calls our prison section Behind Enemy Lines? The prison system, not another prisoner, is the enemy that hopes you won’t get out alive. Embrace Yogi’s spirit and read the words that follow from current and former prisoners who loved him back. Dr. Willie Ratcliff is publisher and Mary Ratcliff is editor of the San Francisco Bay View. They can be reached at editor@sfbayview.com or 415-671-0789. Written July 30, 2006 – Few of us know the name Hugo Pinell. That’s because the last time it was in the newspapers was probably in 1971, or 1976, when he was tried as a member of the famous San Quentin 6, six young Black prisoners facing assault charges stemming from battles with prison guards at the notoriously repressive California prison. Yet that wasn’t the beginning nor the end of things. Hugo Pinell (known as Yogi by his friends) came to the U.S. as a 12-year-old from a small town on Nicaragua’s East Coast. If he knew then the hell he would face in America, would he have left the land of his birth? We’ll never know. He came. And he spent the last 42 years in prison – 34 of them in solitary! He hasn’t had a write-up in 24 years. Now, his family and lawyer are seeking his parole after a lifetime in some of the most repressive joints in America. Why so long? Why so many years? The answer, not surprisingly, is politics. Hugo was a student and comrade of the legendary Black Panther Field Marshal, the late George Jackson, with whom he worked to organize other Black prisoners against the racist violence and prison conditions of the ‘60s and ‘70s. Consider this: When Hugo was sent to prison, Lyndon Baines Johnson was president, bombing in the Vietnam War was intensifying and Martin Luther King Jr. was still alive! California’s notoriously unjust indeterminate sentencing has led in part to the present prison overcrowding that now threatens to bankrupt the system. California’s prisons are roughly 172 percent over capacity, and parole is a broken, nonfunctional agency. That’s not just my opinion, but California State Sen. Gloria Romero, D-Los Angeles, has called the present regime a “failure,” particularly the parole system. Despite California Gov. Arnold Schwarzenegger’s 2004 promises of major reforms of the parole system, which would lead to significant prisoner population reductions, the incarceration rate has soared. Today, there are a record 168,000 people in 33 state prisons, nearly double the rated capacity. 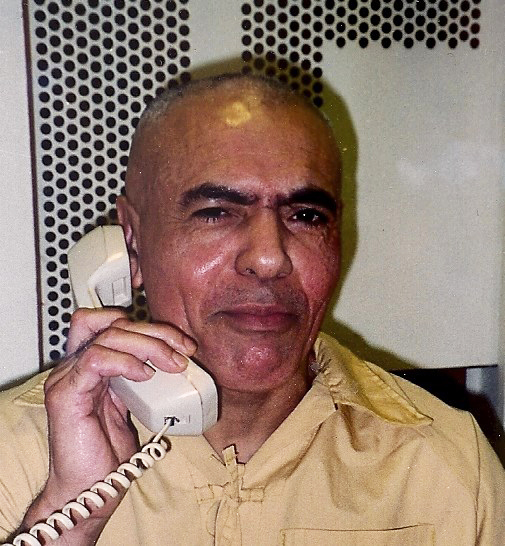 As Hugo Pinell seeks parole, California is spending $7.9 billion – yeah, with a “b”! – in the next fiscal year, an increase of $600 million a year for a prison system that has one of the worst recidivism rates in the nation, 60 percent! Clearly, the so-called “Correctional and Rehabilitation” Department has failed in its mission to do both. Support parole for Hugo Pinell; 42 years is more than enough. © Copyright 2006 Mumia Abu-Jamal. Keep updated at www.freemumia.com. His new book is “Writing on the Wall,” edited by Joanna Hernandez. For Mumia’s commentaries, visit www.prisonradio.org. Encourage the media to publish and broadcast Mumia’s commentaries and interviews. Send our brotha some love and light: Mumia Abu-Jamal, AM 8335, SCI-Mahanoy, 301 Morea Road, Frackville, PA 17932. Hugo Pinell – Rest in Power! We are saddened by the news of Hugo Pinell’s death. 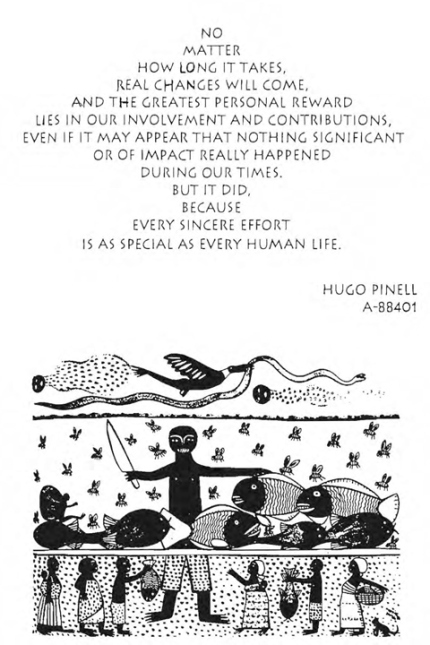 Hugo Pinell always expressed a strong spirit of resistance. He worked tirelessly as an educator and activist to build racial solidarity inside of California’s prison system. Incarcerated in 1965, like so many others, Hugo became politicized inside the California prison system. In addition to exploring his Nicaraguan heritage, Hugo was influenced by civil rights activists and thinkers such as Malcolm X, Martin Luther King as well as his comrades inside including George Jackson. His leadership in combating the virulent racism of the prison guards and officials made him a prime target for retribution and Hugo soon found himself confined in the San Quentin Adjustment Center. While at San Quentin, Hugo and five other politically conscious prisoners were charged with participating in an Aug. 21, 1971, rebellion and alleged escape attempt, which resulted in the assassination of George Jackson by prison guards. Hugo Pinell, Willie Tate, Johnny Larry Spain, David Johnson, Fleeta Drumgo and Luis Talamantez became known as the San Quentin 6. Their subsequent 16-month trial was the longest in the state’s history at the time. The San Quentin 6 became a global symbol of unyielding resistance against the prison system and its violent, racist design. 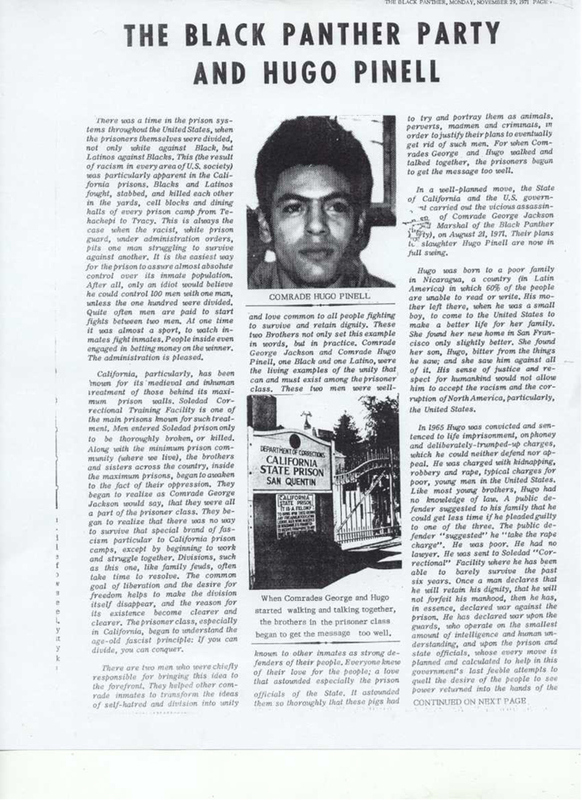 As the California prisons began to lock people up in long-term isolation and control unit facilities, Hugo was placed inside of the SHU (Security Housing Unit) in prisons including Tehachapi, Corcoran and Pelican Bay. There, despite being locked in a cell for 23 hours a day, he continued to work for racial unity and an end to the torturous conditions and racially and politically motivated placement of people into the SHU. This work included his participation in the California Prison Hunger Strikes as well as supporting the Agreement to End Racial Hostilities in 2011. At the time of his death, Hugo had been locked behind bars for 50 years, yet his spirit was unbroken. Claude Marks, director of Freedom Archives, 522 Valencia St., San Francisco, CA 94110, (415) 863-9977, www.Freedomarchives.org, can be reached at claude@freedomarchives.org. 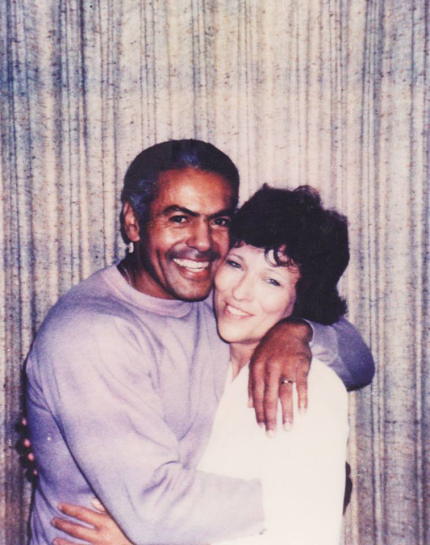 In the early 1970s, while imprisoned in San Quentin State Prison, Hugo Pinell made contact with revolutionary prisoners such as George Jackson, one of the Soledad Brothers, and W.L. Nolen. On August 21, 1971, there was a prisoner uprising in Pinell’s housing unit at San Quentin, led by George Jackson. On that date, Jackson used a pistol to take over his tier in the Adjustment Center. At the end of the roughly 30 minute rebellion, guards had killed George Jackson, and two other prisoners and three guards were dead. Of the remaining prisoners in the unit, six of them, including Pinell, were put on trial for murder and conspiracy. Together, they were known as The San Quentin Six. Three of them were acquitted of all charges, and three were found guilty of various charges. Pinell was convicted of assault on a guard. 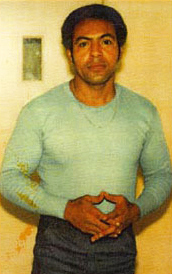 Activists in prison to this day continue to mark the San Quentin prison rebellion as Black August, often with fasting. We’re back with our monthly newsletter/e-mail blast on the status of U.S.-held political prisoner Russell Maroon Shoatz. Many thanks for your continued support and solidarity as we push on in the struggle to free our beloved father, grandfather, husband, and mentor. This month, we bring you an update on Maroon’s recovery from radiation treatment of his prostate cancer, the second installment of our interview series with human rights champion and longtime Maroon supporter Selma James, a letter Maroon recently wrote to the Pope in hopes of having him visit prisoners in the Pennsylvania Department of Corrections, and a brief reportback on the Spring Maroon Tour’s final event in Oakland, California. As always, please feel free to contact us directly with your own ideas and connections to support our efforts. Please also consider contributing to our ongoing fundraising for Maroon. No amount is too little, and all contributions are greatly appreciated. Good News! The radiation therapy that I have been receiving has been successful! On behalf of my family and myself, I again want to extend my deepest thanks to everyone who has helped in any way. Cancer is simply an exceptionally trying condition to deal with, and when a political prisoner like myself suffers that condition, without strong support from the streets there are many elements within the criminal UNJUSTICE establishment who may very well take that opportunity to interfere with the medical professionals who are willing to help heal you. A tragic history that continues to unfold. To read Maroon’s full detailed health journal follow this link. Selma James, writer, activist, co-founder of the International Wages for Housework Campaign, and coordinator of Global Women’s Strike, is interviewed by Raphael Cohen, for the campaign to free Maroon, in Oakland, California, April 25, 2015. In part 2 of this 4-segment series, James discusses her impressions of Maroon’s recent writings regarding sexism and patriarchy in the racial justice movements of the 1960s and ’70s. She applauds Maroon’s critical self-reflection, supportively questions some of his conclusions, and shares her thoughts on the potentially transformative implications of his and other male prisoners’ commitment to naming, condemning, and ending violence against women. As the #SayHerName movement to seek justice in often overlooked police killings of black women intensifies following Sandra Bland’s tragic death last week, James’s thoughts on the importance of men’s solidarity in the struggle for women’s liberation couldn’t be timelier. Watch the interview segment here, and stay tuned for parts 3 and 4 in the coming months. In the lead-up to Pope Francis’s trip to Philadelphia for the World Meeting of Families in late September, Maroon has written the Pope an open letter, inviting him to visit with prisoners in the Pennsylvania Department of Corrections during his stay, and to hear directly from prisoners about their vision for true rehabilitation and an end to mass incarceration, a topic that now seems to be on the U.S. public’s consciousness more than at any point in the previous few decades. 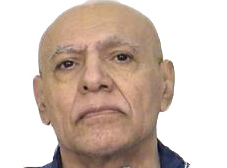 As Maroon states in his letter: “… while I seek forgiveness and work towards reconciliation with those I have wronged and hurt, the bigger picture urges me to also strive towards laying a foundation to help younger people extract themselves from a generations-old racial, economic, and historical set of contradictions that not only led to my imprisonment, but has since metastasized into the criminalization of millions based on their racial and/or economic standing – an unjust, unethical, and ultimate poisoning of society that is at odds with the compassion and broadness of vision that Your Holiness is held in such high esteem for championing. Society has everything it needs to rescue itself from the MASS INCARCERATION fallout that has resulted from these failures. And by overcoming this part of our problems, we place ourselves in a position to challenge others to fashion solutions to other social issues that have been eating away at us for so long. To read Maroon’s full letter to the Pope follow this link. 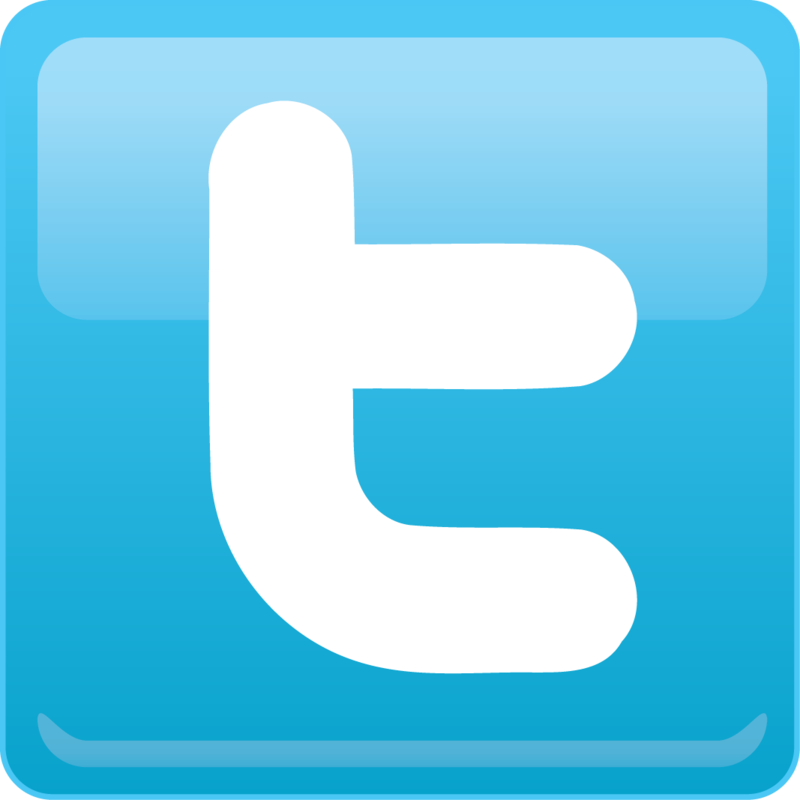 We’ve received indication that the Pope will, in fact, visit Philadelphia’s Curran-Fromhold Correctional Facility (CFC) while in town, and we invite you to reiterate the importance of such a visit, and express your support for it, by tweeting the official Papal Twitter account, @Pontifex, with a message echoing Maroon’s sentiments. We ask that you not specify Maroon by name, but rather, use the slogan he’s put forth in his letter. 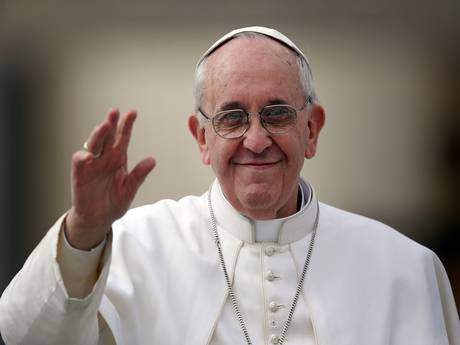 One such tweet tweet might read: “@Pontifex Please take time to meet Pennsylvania prisoners. MASS EDUCATION–YES! MASS INCARCERATION–NO!” If you do choose to tweet, please also include the hashtags #PopeVisitPAprisoners and #PopeInPhilly. 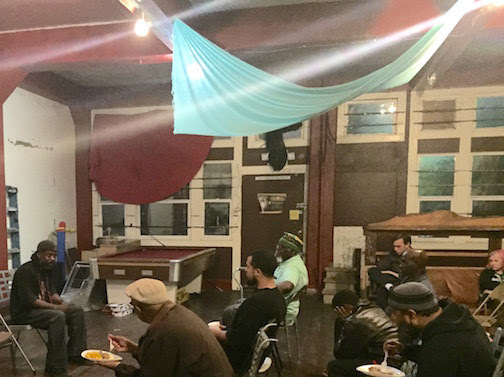 Lastly, the Spring Maroon 2015 Book and Culinary tour concluded this month in Oakland, California, with an event entitled “The 4th of the Lie,” a panel discussion “about the importance of independence and self-determination for colonized peoples,” hosted by the Qilombo Cultural Center. 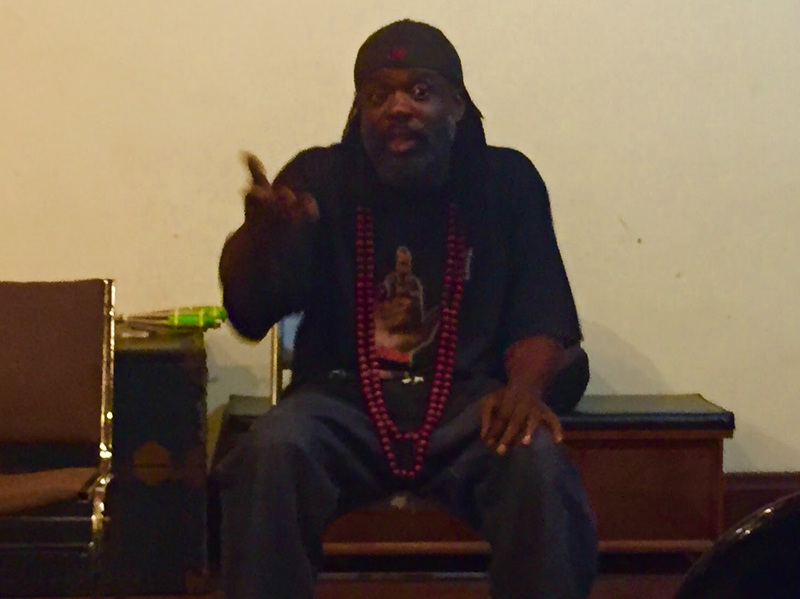 Maroon’s son, Russell the III, joined Shaka At-thinnin, founder of the Black August Organizing Committee, on the evening of July 4th, to expound on some of his father’s ideas from the essay collection Maroon The Implacable. While fireworks and car alarms were going off every couple minutes right outside of Qilombo’s doors, Russell shared his thoughts with a multi-generational audience on the importance of coalition-building across movement sectors, even and especially when said sectors may be unfamiliar with one another’s mores and norms; the importance of men challenging sexism and supporting the aspirations and self-determination of women; and the crucial role of localized food production in the midst of large agri-business expansion, coupled with lack of access to healthy food and chronic health problems in working class communities of color. This last point proved especially timely, as Qilombo community members have recently been involved in a struggle to preserve the Afrika Town Garden they established for the purpose of providing healthy, locally-grown produce to their neighborhood. After years of neglecting the lot on which Afrika Town was recently born, its owner has threatened to evict volunteers and raze the garden, in a clear attempt to make his property more appealing to potential well-off buyers in a rapidly gentrifying part of town. Read more about the struggle to defend the Afrika Town Garden. California officials Monday said 30,000 inmates refused meals at the start of what could be the largest prison protest in state history. Inmates in two-thirds of the state’s 33 prisons, and at all four out-of-state private prisons, refused both breakfast and lunch on Monday, said corrections spokeswoman Terry Thornton. In addition, 2,300 prisoners failed to go to work or attend their prison classes, either refusing or in some cases saying they were sick. The corrections department will not acknowledge a hunger strike until inmates have missed nine consecutive meals. Even so, Thornton said, Monday’s numbers are far larger than those California saw two years earlier during a series of hunger strikes that drew international attention. The protest, announced for months, is organized by a small group of inmates held in segregation at Pelican Bay State Prison near the Oregon border. Their list of demands, reiterated Monday, center on state policies that allow inmates to be held in isolation indefinitely, in some cases for decades, for ties to prison gangs. Though prison officials contend those gang ties are validated, the state last year began releasing inmates from segregation who had no evidence of gang-related behavior. Nearly half of those reviewed have been returned to the general population. The protest involves the same issues and many of the same inmates who led a series of protests in California prisons two years ago. At the height of those 2011 hunger strikes, more than 11,600 inmates at one point refused meals. The correction department’s official tally, which counts only those inmates on any given day who have skipped nine consecutive meals, never rose above 6,600. ANAHEIM (KTLA) — A crowd of neighbors got a bit unruly Saturday night after a man was fatally shot by police earlier in the evening. The shooting happened around 4 p.m. in an alley near the 600 block of N. Anna Drive. Two officers made contact with three men, who then fled. According to a witness, an officer caught up to one of the suspects in an apartment courtyard, shot him once and told him to put his hands behind his back. They then shot him again, striking him in the head. The suspect was transported to a local hospital where he later died. The crowd threw rocks and bottles the the officers investigating the incident. Officers pushed the crowd back and they left the scene. Officers returned to the scene five hours after the shooting after the crowd refused to disperse from the area. At one point, the neighbors lit a trash can on fire and threw it into the street. Police say several bystanders were arrested during that scuffle. The other two suspects are still on the loose. Video of police response to the rebellion, where police use bean bag rounds and dogs to attack a crowd that included small kids and families.